Today is the second anniversary of the opening of Laurelhurst, Portland’s largest residence addition. Just two years ago this property, then known as the Hazelfern Farm, was purchased from the Ladd Estate Company by a syndicate of Seattle and Portland capitalists for a consideration in the neighborhood of $2,000,000. At the time it was the largest realty transaction that had ever been made in Portland, and while many large realty deals have been made here since the Laurelhurst sale, none have approached it, so far as the size and consideration is concerned. 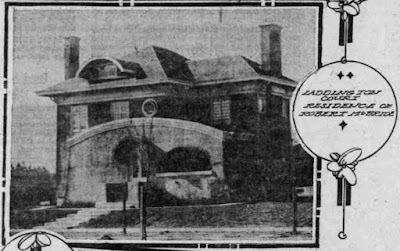 Laurelhurst today presents a vastly different appearance from the Ladd dairy farm of two years ago. The tract is now a magnificently improved high grade residence addition, and is rapidly filling up with superior class of attractive, up-to-date homes. Nearly $2,000,000 has been expended in the last 18 months improving Laurelhurst. There are now in the addition 26 miles of asphalt streets, 52 miles of cement sidewalks, nine-foot parkings, shade trees and a greater part of the addition has cluster curb lights on both sides of the street. During the first year there have been erected nearly 100 residences from $3500 to $25000. The tract was originally laid out after the most approved scientific landscape architecture. The streets were made to conform to the contour of this ground, with the result that although the tract is of rolling character there is no unsightly fills and cuts in the streets. Meat & Murphy, selling agents for Laurelhurst, have extended an invitation to the automobilists of the city to use the streets of Laurelhurst throughout the rainy season for pleasure motoring. The property is reached from the center of the city over the Burnside bridge and East Burnside street, which is hard surfaced to and through the addition. The 26 miles of asphalt streets in Laurelhurst, together with the hard surface of East Burnside, will afford the automobilists several hours of pleasant motoring during the Winter afternoons. Laurelhurst is the scene of unusual building activity, and has been throughout the Summer and Fall, nearly 100 new homes having been completed there this year. W.L. 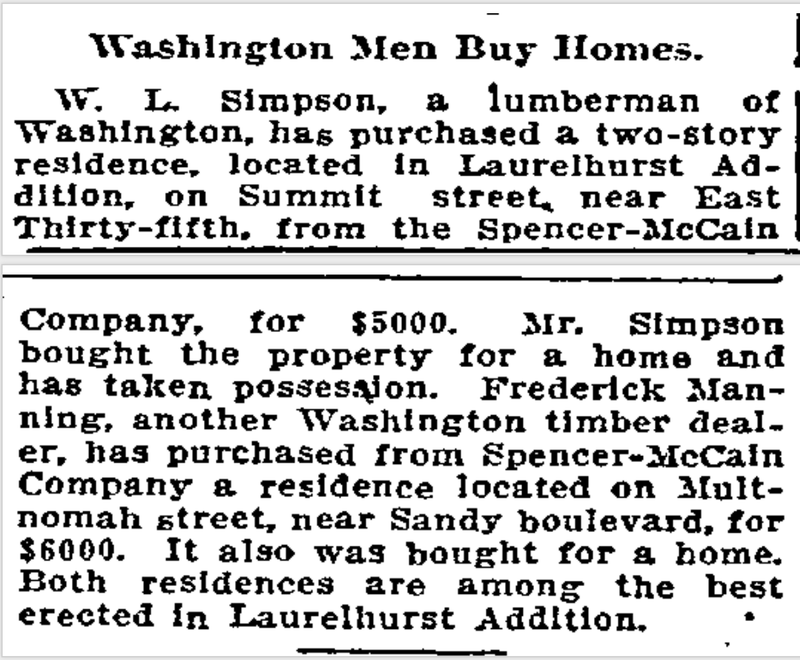 Simpson, a lumberman of Washington, has purchased a two-story residence, located in Laurelhurst Addition on Summit street (should have been Senate street), near East 35th, from the Spencer-McCain company, for $5000. Mr. Simpson has taken possession. 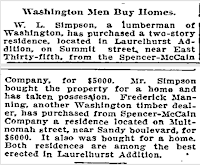 Frederick Manning, another Washington timber dealer, has purchased from Spencer-McCain Company a residence located on Multnoman street, near Sandy boulevard, for $6000. 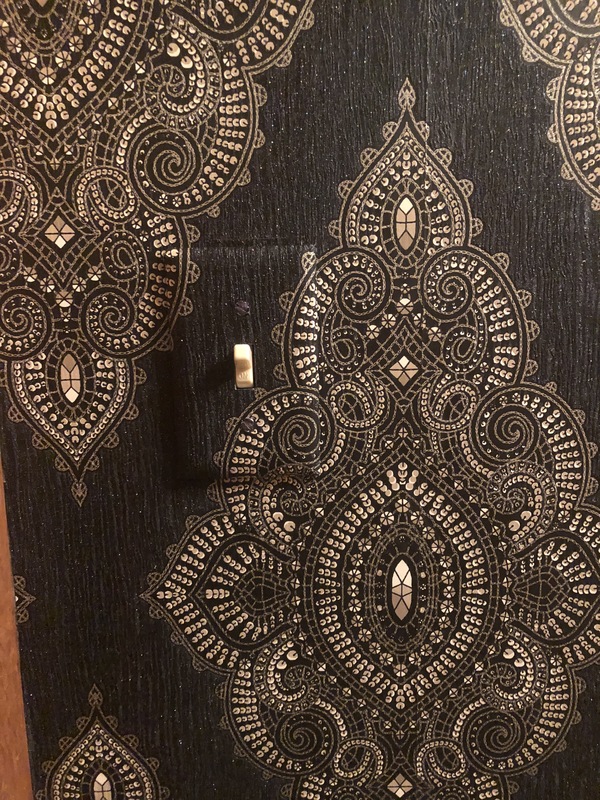 It also was bought for a home. Both residences are among the best erected in Laurelhurst Addition. With 26 miles of asphalt streets, 52 miles of cement sidewalks, nine-foot parkings, shade trees and numerous cluster curb lights, Laurelhurst ranks among the finest and largest residence additions of the Pacific Coast. One could hardly believe that this magnificent and highly improved subdivision was 24 months ago a farming estate, entirely detached from the city. But the expenditure of $2,000,000 has brought about this transformation in less than 18 months and in the past year there have been erected numerous costly dwellings, many of them the finest in Portland. The purchase price of the tract was nearly $2,000,000, making a total investment by the Laurelhurst Company of $4,000,000. The development of Laurelhurst is now complete. Every feature necessary in modern home building is provided in this addition. The location is ideal, the ground being high and offering beautiful views the mountains. Broad paved avenues connect the addition directly with the business center of the city, while three carlines provide quick transportation for the district. There has been a marked activity in homebuilding all year. The movement this Fall has been especially brisk. Up to the present time there has been expended in residences between $500,000 and $600,000 and it is expected that, at the rate lot sales are made and contracts for construction let, there will be fully $1,000,000 represented in residences by the early part of Spring. 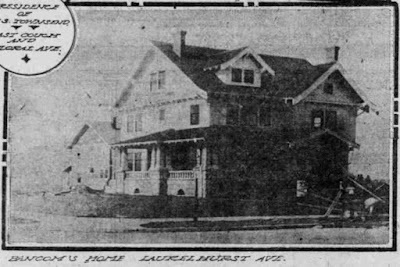 During the first year there have been nearly 100 homes established in Laurelhurst, ranging in values from $3500 to $40,000. Within the past few days there have been many contracts let for new dwellings, many of which will be of high-class construction. So far this month sales of residence sites have exceeded $50,000 and it is declared that virtually all of the buyers will erect dwellings at once. 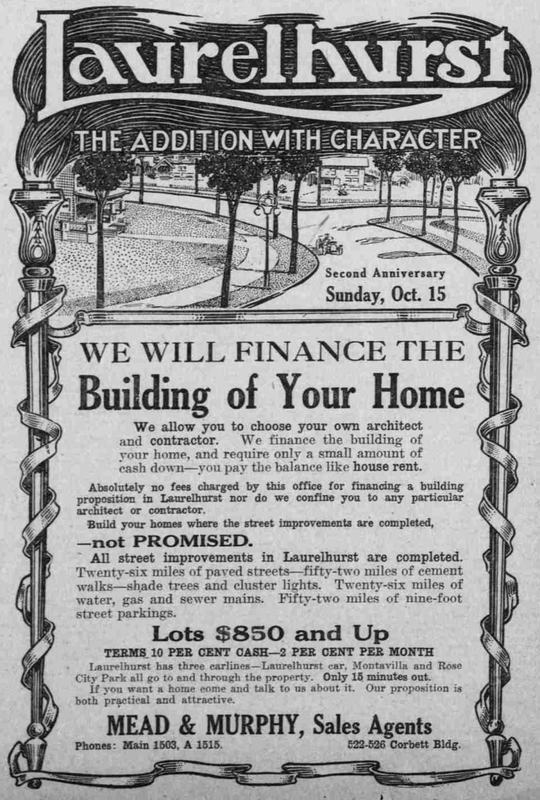 In the opinion of Mead & Murphy, selling agents for Laurelhurst, the actual building-up of the addition has just commenced and they believe that within another year the immense district will be well fitted with homes. Among the striking residences that have been completed residences that have been completed recently are those of Dr. H.I. Keeney, costing $25,000; C.K. Henry, costing $60,000; B.L. Bancom, costing $15,000; C.W. Townsend, $15,000; Laurelhurst Company, $12,000; P.S. Easterly, $8500; W.N. Stiles, $7500; H.W. Lempke, four houses, $30,000; C.R. Lewthwaite, three houses, $20,000; G.W. Priest, 12 houses, $60,000; H.S. McCutchin, $4000; C.H. Page, $5000; William Painter, $5000; Mrs. Isabella Ball, $4500; W.N. Everett, $7000; Hugh Glenn, $6000; L.J. Undahl, $5500; A.A. Trend, $7200; Provident Investment & Trustee Company, $10,000; W. Dorris, $5000; L.M. Rouse, $5000; H. Gordon, $6000; Spencer-McCain, two houses, $12,000; A.C. Crawford, $5000; George Cooper, $7000; C.A. 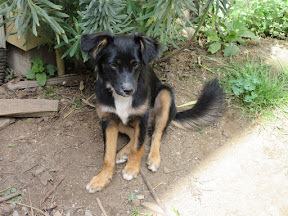 Hoy, $5500; and W.L. Page, $6000. 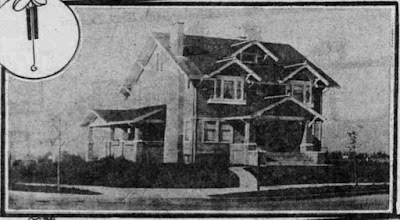 All of these houses are modern throughout and with the ideal surroundings, it is doubtful whether any residence district can compare with Laurelhurst. Many of the residences are elaborately and artistically finished in hardwood and mahogany. Nearly all of the leading styles of architecture can be found. 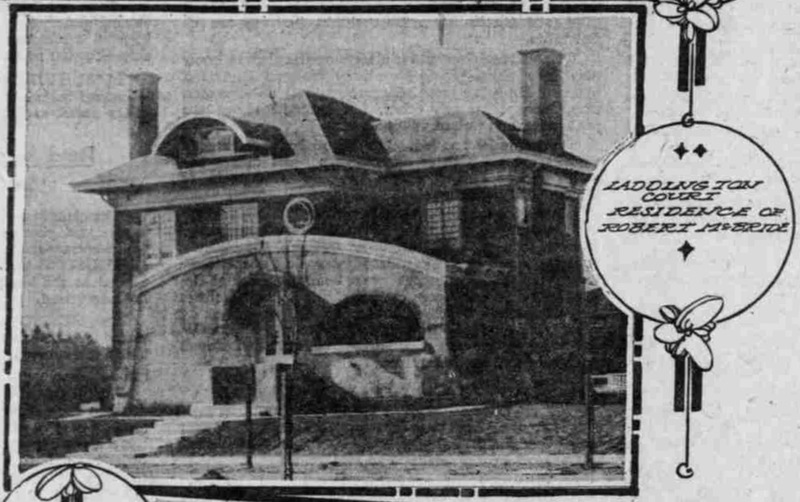 Most of the houses contain two stories and basement. There are few dwellings of the bungalow type in the addition. 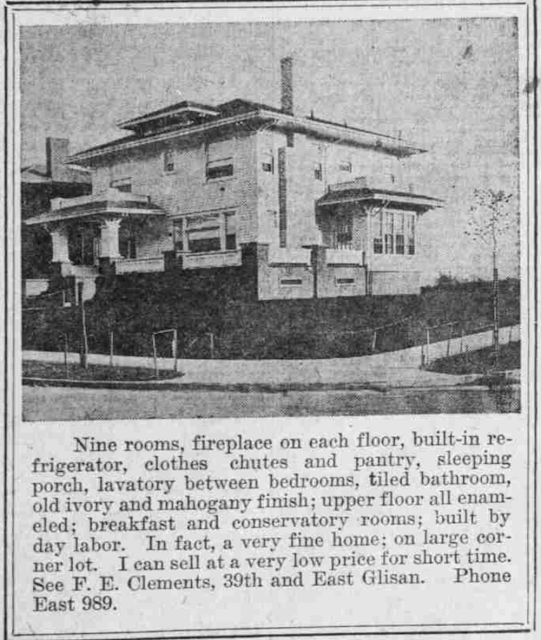 Nine rooms, fireplace on each floor, built in refrigerator, clothes chutes and pantry, sleeping porch, lavatory between the bedrooms, tiled bathroom, old ivory and mahogany finish; upper floor all enameled; breakfast and conservatory rooms; built by day labor. In fact, a very fine home; on large corner lot. I can sell at a very low price for short time. See F.E. Clements, 39th and East Glisan. Phone East 989. 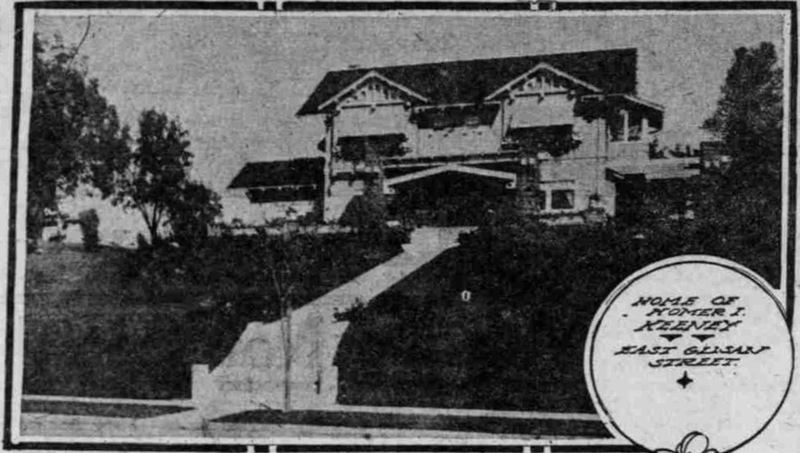 From the Sunday Oregonian, 22 Oct 1911. 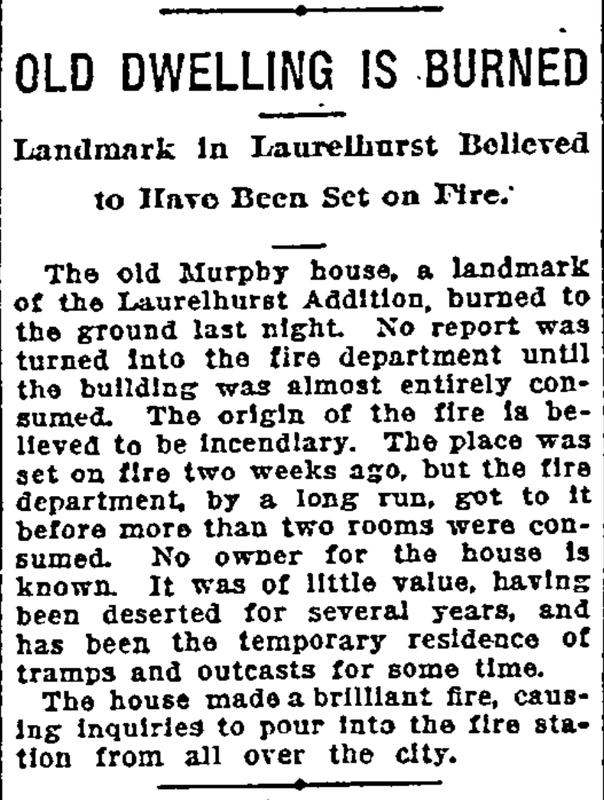 The old Murphy house, a landmark of the Laurelhurst Addition, burned to the ground last night. No report was turned into the fire department until the building was almost entirely consumed. The origin of the fire is believed to be incendiary. 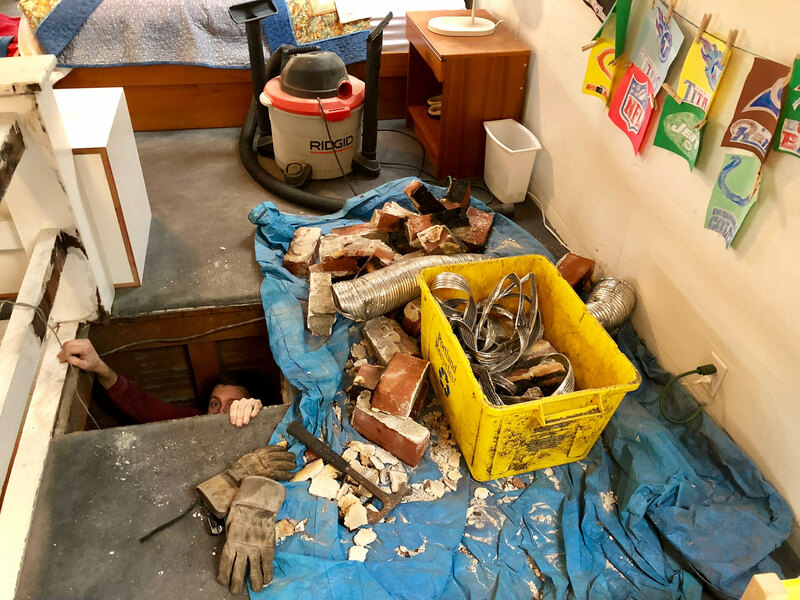 The place was set on fire two weeks ago, but the fire department, by a long run, got to it before more than two rooms were consumed. No owner for the house is known. It was of little value, having been deserted for several years, and has been temporary residence of tramps and outcasts for some time. 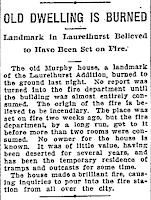 The house made a brilliant fire, causing inquiries to pour into the fire station from all over the city.